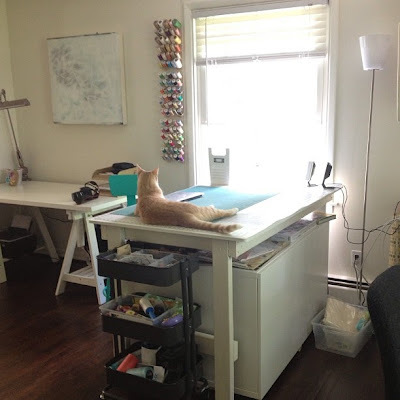 I mentioned a while ago that we moved into a new house, but I haven't shared many photos of my new studio with you. 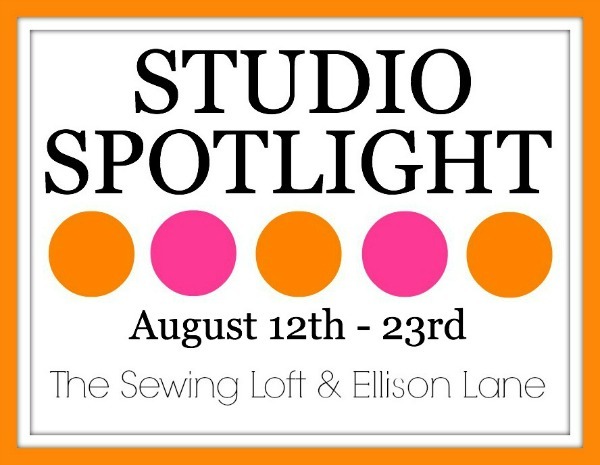 Jennifer and Heather asked me to participate in their Studio Spotlight series, so I'm glad to share more with you now as part of that. 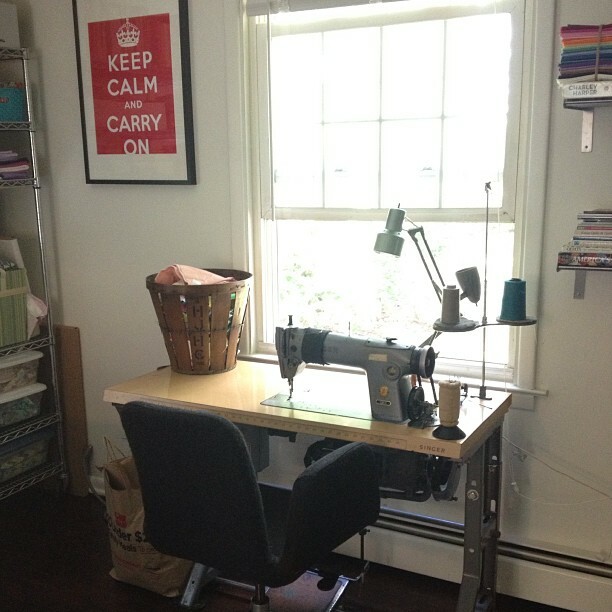 Without a doubt my favorite thing in my new space (besides the great natural light) is my vintage industrial Singer sewing machine. It's a Singer 281-1 from the 1960s I was lucky enough to come across it this past spring, when I found out that the downtown Cincinnati location of Brooks Brothers was closing and getting rid of their machines. I was out of town at the time, in Cleveland shooting for Quilting Arts, but thankfully I made it home in time to rent a truck with my husband and pick one up. We moved it to our new house, even though we weren't living here at the time. We were still doing renovations, but we knew that we didn't want to have to move this thing twice. It's heavy!!! This thing is no joke. 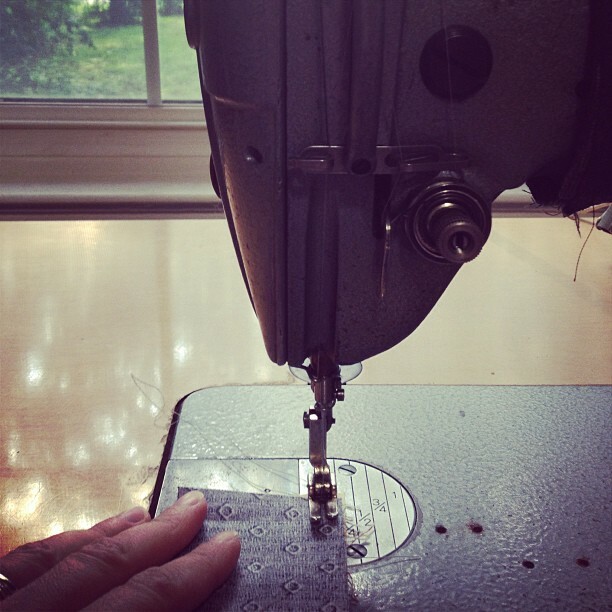 It has a speed up to 1500 stitches per minute and a an oil pan below the table top. It's a solid machine. 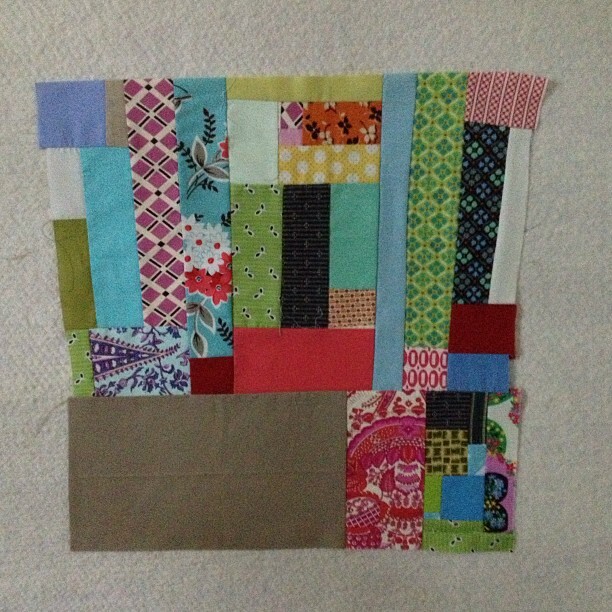 This large improv patchwork block was the first thing that I sewed on it last month, to try to get the hang of the machine. It's fairly easy to use, although it has taken a bit of time to get used to its speed. To the left of my machine is a large industrial metal shelving unit that holds some of my fabric and books. I've got some scraps and works in progress stored in some plastic bins, and larger cuts of fabric on bolts. 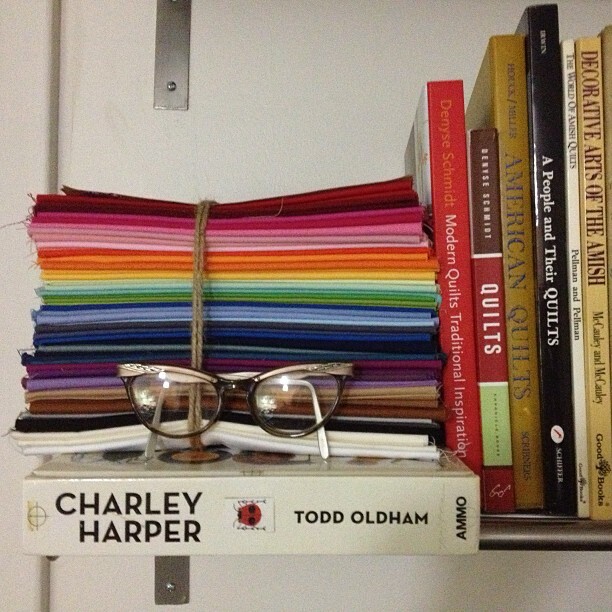 I've also arranged some of my smaller cuts of solids in color order on one of the shelves. 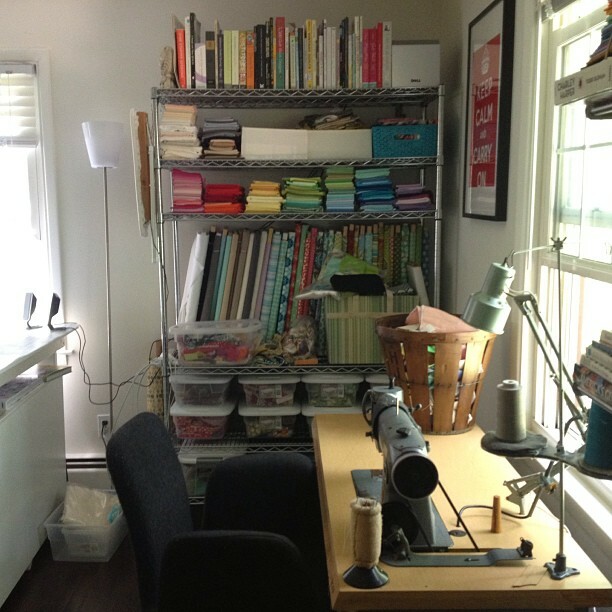 To the left of the metal unit is my large cutting table and more fabric storage. As you can see, the table is a popular place for one of my helpers to hang out. And honestly, it's not usually that clean, although I'm certainly trying to keep it that way. I've got some supplies in this fun metal cart from Ikea. 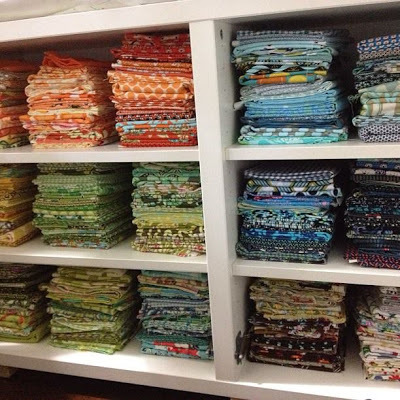 Beneath the cutting table are two storage units from Ikea that house a lot of my printed fabric stash. It took a long time to fold all of this, but I think the end result was worth all of the effort. 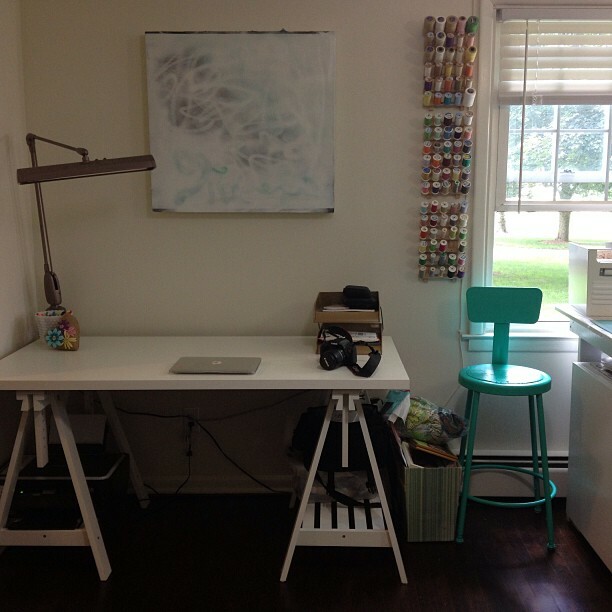 And next to the cutting table is my desk, which also came from Ikea. I really love this desk because it's really a drafting table, so I can adjust the height and angle of the top when I draw and paint. 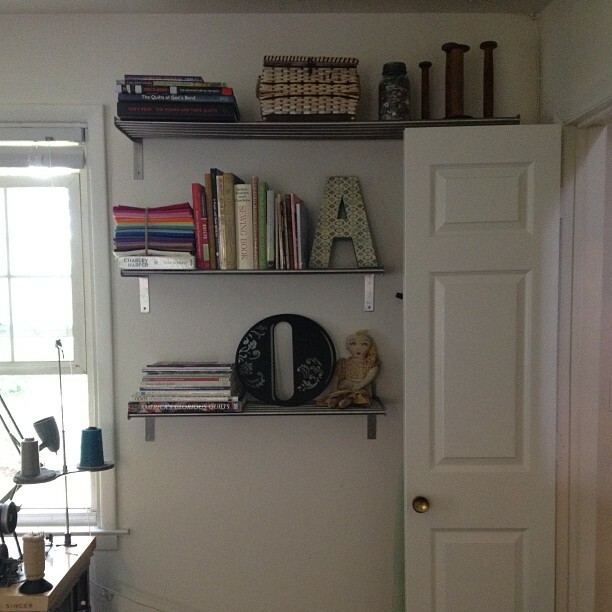 It's also got a bit of storage underneath it on two shelves, which is great. I keep most of my threads on three thread hangers that I've mounted to the wall. Behind my desk is a vintage striped chair that I picked up at a thrift store and a couple of old wooden baskets where I keep more scraps. 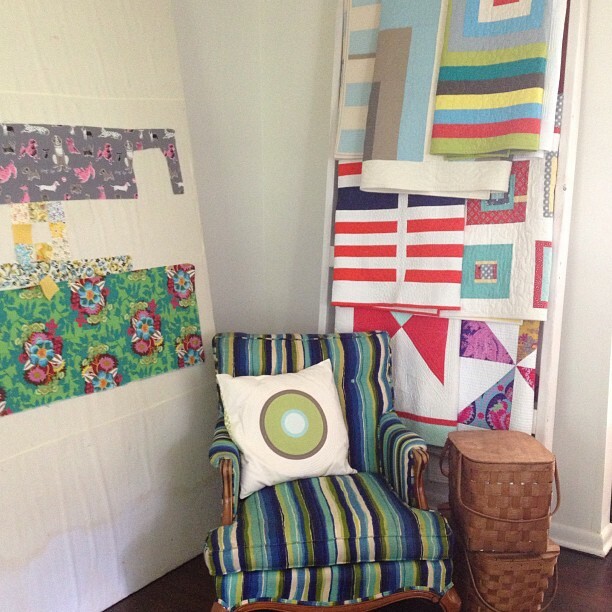 My husband built the large quilt ladder where I keep finished quilts. It's getting quite full so we definitely need to make a few more for the house, and I'm working on a tutorial for that project that I hope to be able to share with you soon as well. 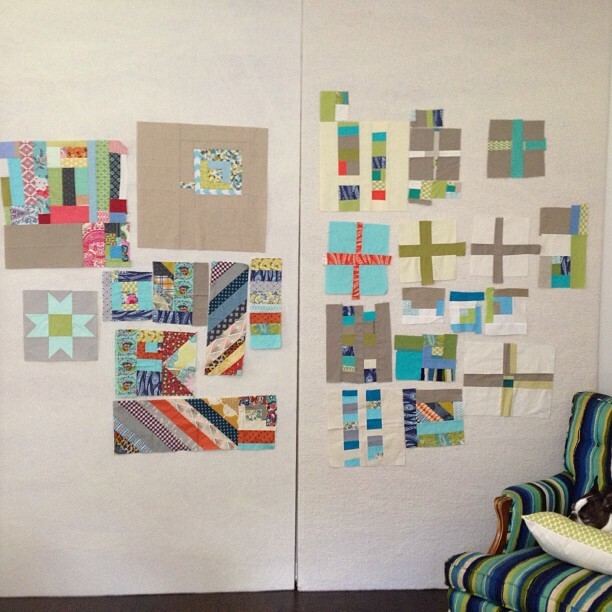 And next to the chair is my design wall. You can see how I made those here, although I recently recovered them with batting instead of flannel. And you can see that the chair is also a popular spot for my helpers. And finally, coming around next to my sewing machine is a series of metal shelves from Ikea. 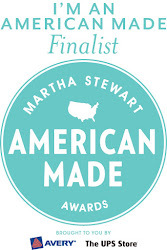 I've got some of my favorite books and magazines there, as well as some other fun things like my vintage sewing basket and a handmade doll that I picked up at a flea market in Tennessee last year. I've also got this lovely stack of fabrics that was a gift from a friend, and some fun vintage glasses for inspiration. 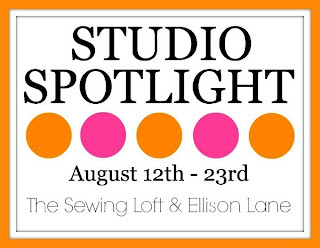 Thanks so much for stopping by my visit on the Studio Spotlight series by The Sewing Loft and Ellison Lane Quilts. Be sure to check out all of the great stops on the tour this month as well!